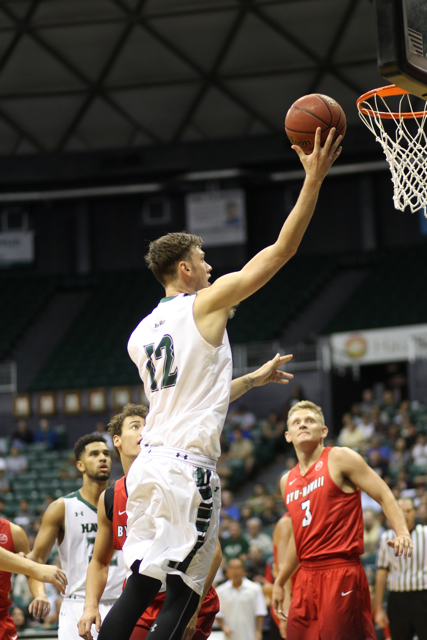 With eight new faces and only three returning ones, the 2016-17 University of Hawai’i men’s basketball team still managed to produce a familiar result Thursday night with a resounding 97-74 exhibition victory over Brigham Young-Hawai’i. A small-but-delighted crowd of about 1,800 at the Stan Sheriff Center watched Sheriff Drammeh scored a game-high 19 points, Noah Allen add 15 points and eight rebounds, and Leland Green contribute 13 points as the Rainbow Warriors faced their first competition in public since last season’s historic 28-6 campaign. The newcomers include Allen, Green and Gibson Johnson, who added 12 points and eight boards. Another newcomer, Matt Owies, scored 12 points and grabbed three rebounds. Jack Purchase, who sat out last season as a redshirt, contributed 11 points, six rebounds and five assists. There was much to be pleased about, almost from the very beginning. The Rainbow Warriors jumped out to a 12-4 lead in the first four minutes and never looked back. Their first three baskets were made by newcomers Allen (6-foot-7 transfer from UCLA), Green (6-2 freshman from Redondo Beach, Calif.) and Johnson (6-8 transfer from Salt Lake Community College). Green’s 3-pointer broke a 2-2 tie and sparked a 15-2 run capped by Allen’s 3-pointer that put UH ahead, 17-4, barely six minutes into the game. Two minutes later, the score was 24-9 and the Rainbow Warriors had made 11 of 16 field goals (68.8 percent) off of seven assists and out-rebounded the Seasiders, 13 to 1. After Hawai’i stretched the lead to 27-9, the Seasiders started to claw back and eventually closed it to 32-25 after Shad Watson’s baseline jumper with 4:19 remaining in the first half, but that was as close as they would get despite draining 16 shots from beyond the arc. 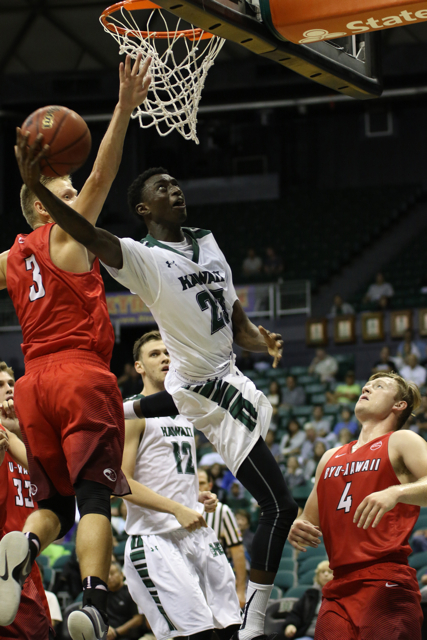 A layup by Purchase and mid-range jumper by Drammeh bookended an 11-2 run that put the Rainbow Warriors ahead, 43-27, with 1:14 before halftime. 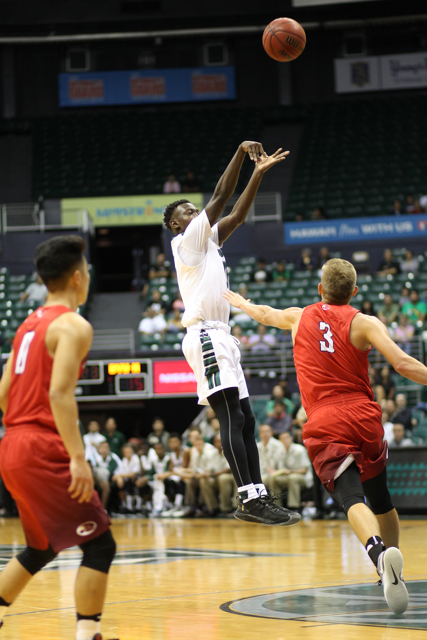 Hawai’i extended the lead to 44-30 by intermission and BYUH could not close the gap in the second half. Drammeh, the only active returnee who saw significant playing time last season, made his debut at point guard and looked mostly comfortable in finishing with three assists, three turnovers and two steals. “It was good for to get out there as a team, in front of the fans, and do some of the things we wanted to do,” Allen said. Ganot acknowledged there still is much work to do before the Nov. 11 season opener vs. Southern Illinois-Edwardsville. The Hawai’i roster lists 15 players, but four did not see action in the exhibition: Mike Thomas (redshirting due to wrist injury), Drew Buggs (knee), Darryl Matthews (ankle) and Zigmars Raimo (suspended). To ADD UHMBB Back to Post-Season, Would MT Come out of Semi-Retirement? akuhead2 re: prior day’s post, you were right the 1st time. UH plays SIU. This is the second validational team for coaching staff excellency! I liked our defense for the first ten minutes and then it slowly deteriorated and at the end of the second half it looked like a summer league game. YU-HI just wore themselves down and their lack of height sealed the deal before the game started. A lot of positives as noted above but they have to work on defense or we are going to pay the price. I agree that there were a lot of positives but it is still hard to take anything from this win because lets not forget the opponent. I have to say, that was not a good team for BYUH, not even for D2 level. All they wanted to do was shoot the 3 ball! Did anyone listen to the Artie Wilson show this morning? Just as I reached my destination, Artie was going over the talking points of the show. He was at the game last night and seemed to indicate that he wasn’t very impressed with the team. I’m curious as to what his assessment was. Just looking at the video, first, I was impressed that Jack Purchase moved without the ball pretty well for a big man. That could come in real handy. Also, Noah Allen was like silk the way he shot the ball. So smooth. Nice. Both Noah Allen and Gibson Johnson have got the tear drop shot going on. This will be a very interesting offense. I guess we are still waiting to see how the defense will be against D1 competition. It hasn’t been said much out loud, but this appears to be a pretty complete team. 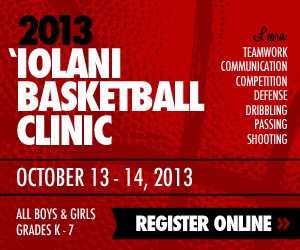 Go Bows !